What a terrific, culturally appropriate marketing ploy! When I lived in Japan, I was oh-so-conscious to cover my mouth with my hand when I laughed out loud, or if I had to open it real wide while eating. “Ochobo,” or a small mouth, is traditionally seen as a sign of feminine beauty in Japan. 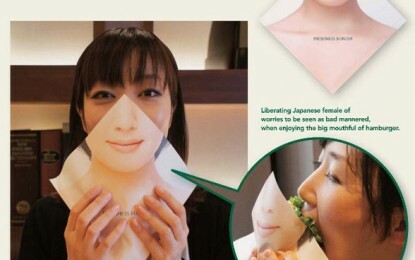 A national hamburger chain wanted to sell more of its biggest, juiciest, wide-mouthed burgers to women, so it came up with an ingenious idea: the “liberation wrapper”—a stiff paper burger wrapper, imprinted with a closed mouth. The person eating is able to hide behind a dainty little face, saving others from having to watch them chow down. Every society is changing, and there are plenty of women in Japan who eat burgers in public. There are also those who don’t cover their mouths when laughing. But, hey, this is fun and cool! Maybe next will come a not-so-culturally-necessary but cool men’s “liberation wrapper”! Here’s an article on the promotion, from the Japan Daily Press. This promotion reminds me of a story years ago, recounted to me by the then-Director of Tokyo Disneyland. In planning for Adults’ Day (成人の日), the workers realized that many young women would be coming to Disneyland in silk kimono. Knowing that the water spray could damage the expensive kimono, the workers prepared signs, warning the young women of the danger and cautioning them to avoid certain water rides. The Director scolded them, saying their signs ran counter to the Disney way. “You must figure out a way to let the young women enjoy the rides, in their expensive silk kimono.” The solution? They had a bunch of plastic raincoats made special for Adults’ Day. What is your favorite culturally appropriate customer service or marketing story? This entry was posted in Cultural EFFectives – Successes and tagged Cross-cultural communication, cross-cultural skills, Cultural Detective, culturally appropriate advertising and promotion, current events from an intercultural perspective, intercultural competence by Dianne Hofner Saphiere. Bookmark the permalink. What a great idea! I didn’t know the concept of OCHOBO before but this marketing concept is just brilliant! Glad you enjoyed it, Julia. It’s good to share success stories, especially when they factor in culture. Thanks for joining us here.